The Gladys Frisch Harris Piano Festival returns to Hastings College in April, bringing an outstanding teacher-performer to campus for a day of informative and inspiring activities. 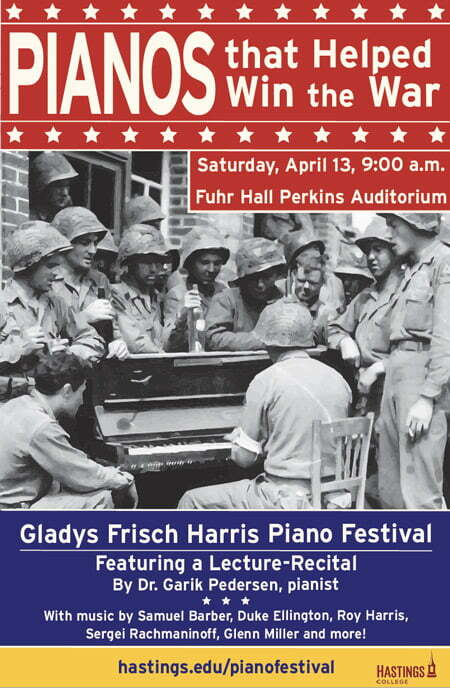 This year’s clinician is Dr. Gary Pedersen, who will give a lecture-recital on “World War II Music: The Pianos that Helped Win the War,” at 9:00 a.m. on Saturday, April 13 in Fuhr Hall (723 E. 9th Street). The lecture includes time for audience members to ask questions, and is free and open to the public. Pedersen’s lecture is part of the “Victory Vertical Project,” which uses descriptive vignettes accompanied by piano music in many styles — classical, popular, boogie-woogie, jazz and movie soundtracks — to bring to life a remarkable account of courage, solidarity and the power of music. Pedersen, a Steinway Artist, performs music by Samuel Barber, Richard Addinsell, Roy Harris, Duke Ellington and others to provide a moving glimpses into the war that united people with a common purpose. As part of the festival, students in grades 8-12 are invited to work with Pedersen and Hastings College faculty. Master classes begin at 10:30 a.m.
“These master class sessions are a great way to coach literature for upcoming solo recitals, Guild Auditions, contests or NMTA District Festivals,” said Dr. Jonathan Sokasits, Hastings College professor of piano. Details and a registration form for students are available at hastings.edu/pianofestival. Dr. Gary Pedersen, a Steinway Artist, has performed as a soloist and chamber musician throughout the United States, Europe, Canada, Central America, Taiwan and the Philippine Islands. He has presented programs for the U.S. State Department, the National Federation of Music Clubs, Music Teachers National Association, the European Piano Teachers Association, Canadian Federation of Music Teachers Associations, the Royal Conservatory of Music and on numerous public television and radio broadcasts. Currently a professor of piano at Eastern Michigan University, Pedersen has taught undergraduate and graduate students from many U.S. states and 13 other countries, producing prize winners in national, international and state competitions. Pedersen has appeared at numerous summer music festivals, including Cleveland’s International Music Festival, Spokane’s Musicfest Northwest, the World Piano Conference (Serbia), Tunghai Summer Music Festival (Taiwan), Michigan’s Interlochen and Blue Lake camps and other music camps and festivals in Arizona, Iowa, Missouri, Colorado, Kentucky and Indiana. Pedersen is a past president of Michigan Music Teachers Association, which honored him with its Distinguished Service Award in 2016. He received the Michigan Touchstone Award in 2017 in recognition of his “commitment to Michigan’s artistic excellence and his advocacy for the arts.” He is listed in the 2018 edition of Who’s Who in Fine Arts Higher Education.